The Syma X1 4 Quadcopter UFO is another entry into the world of budget priced quadcopters. It is primarily designed for indoor flight, and while it comes with both indoor and outdoor flight modes, it does struggle with outdoor flight. It comes with a 2.4ghz LCD remote control, and allows the drone to be controlled from a maximum distance of 130 feet (40 metres) away. The remote is really quite good on this model, and problems with interference and connection to the quadcopter are exceedingly rare. 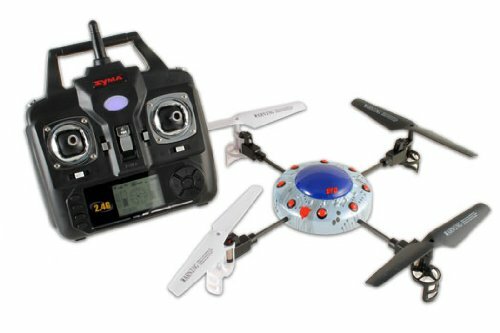 The Syma X1 UFO does support trick flying and allows you to complete barrel rolls, flips and banking, but the recovery on failed tricks can be somewhat difficult with this quadcopter. With that being said, this is an extremely durable quadcopter, and it comes with replacement parts in case you manage to damage them in a particularly rough crash. It comes with a 3.7v lithium polymer battery that allows about 5-6 minutes of flight time, though many people actually report longer flight times. It seems that average flight time for this drone is somewhere in the neighborhood of 9-10 minutes, though it is always recommended to play it safe and only aim for 5-6 minutes. The battery takes approximately 45 minutes to charge fully. I had just finished reviewing a similar budget priced Hubsan X4, when I received the Syma X1 test model. The Hubsan X4 really was an excellent small drone, so I had equally high hopes for the Syma X1. I used the usual controlled demolition to get the packaging open, and after checking the assembly of the drone, and charging the battery, I was ready to go. I took it for the usual test flight around my house, which as per usual, made my dogs scurry to shelter. The drone does fly very well inside, and the controls are extremely responsive. I also have to say that the drone is very stable, and easy to fly. 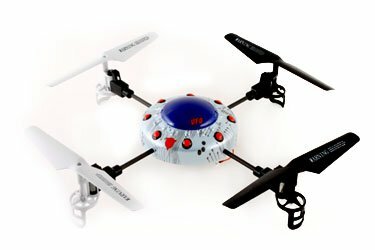 Even someone new to drones, could be flying this quadcopter like a pro in a short period of time. I hate to admit it, but I crashed this drone pretty hard in my house. I’d like to blame the drone, but this was totally pilot error on my part. The drone hit my wall hard, and spun out of control to the floor. This is where the durability really shone though – there was absolutely no damage to the drone. Once I was done testing the drone inside, it was time to take it outside. The drone comes with an indoor and outdoor flight mode, but even in the outdoor flight mode it really struggled. I will say that they conditions weren’t perfect, but it did have a hard time stabilizing itself. I also observed it shaking several times, which is a bit unusual for even budget priced drones outdoors. I ran it through several of the more advanced maneuvers, and it performed them relatively well. While this is an excellent indoor drone, you really should avoid outdoor flights in all but the most calm conditions. The Syma X1 UFO Quadcopter is a good budget priced drone that is great for someone just getting started with quadcopters. With that being said, if you’re willing to put up with a bit of a steeper learning curve, the Hubsan X4 is actually a better drone in my opinion. Both have their pluses and minuses though, and for someone who wants an easy drone right out of the box, the Syma X1 is for you.